It was after following her IG account back in 2017 that I knew I wanted it to be done by the incredibly talented Gee Hawkes. 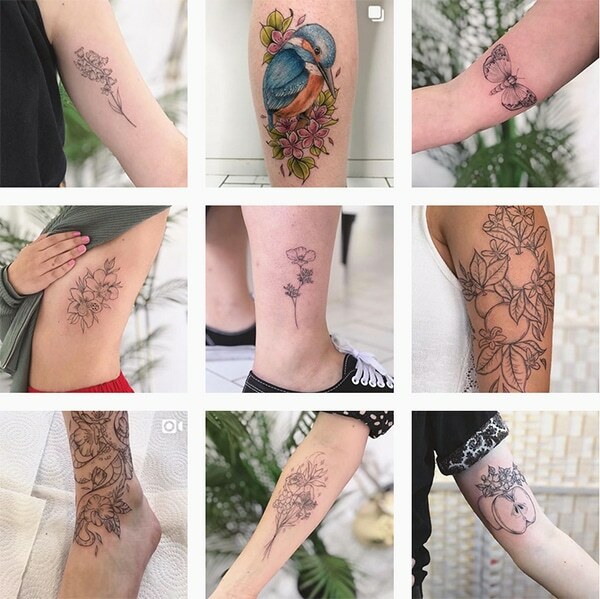 Known for her outstanding line work tattoos and beautiful floral pieces, I knew she’d be the perfect tattooist to make my idea a reality. Then I found out that she had a waiting list as long as the Eiffel Tower, and her books weren’t open very often, so I put my dreams on hold. 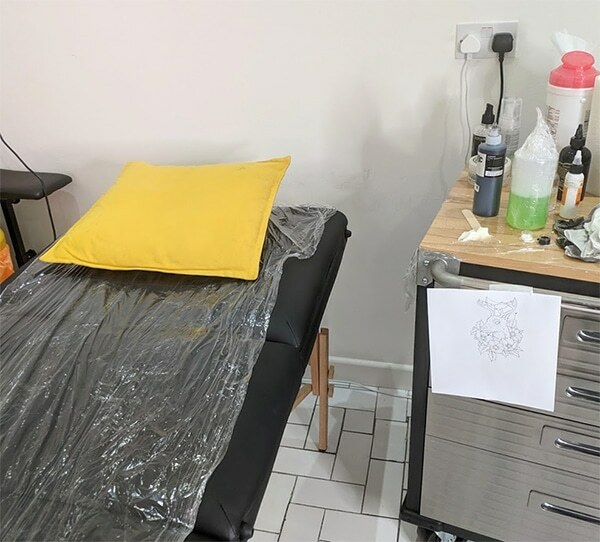 Since I’d first met her, she’d moved over to Top Boy Tattoo in Hove, so I excitedly travelled there in the afternoon to check out her new studio (and to get tattooed, obviously). The studio was absolutely massive and looked incredible!! 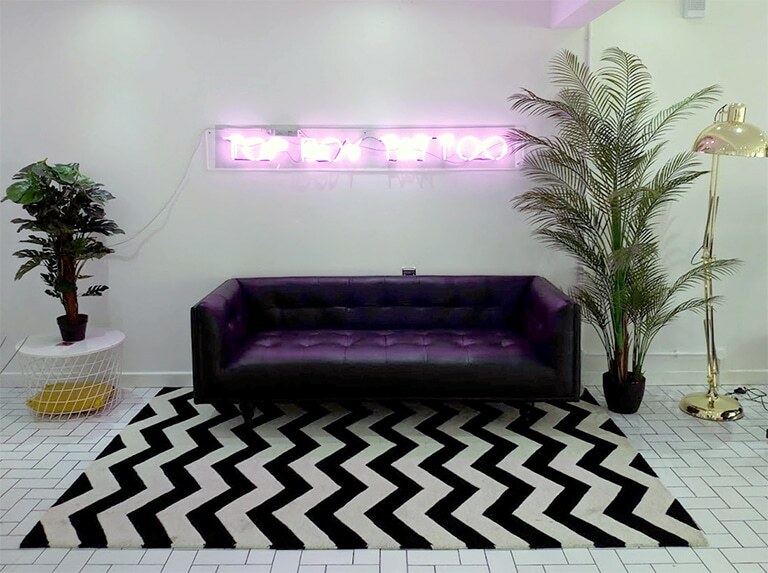 I loved the neon signs and all the plants dotted around! There was a really relaxed vibe about it! This was probably my least painful tattoo to date. 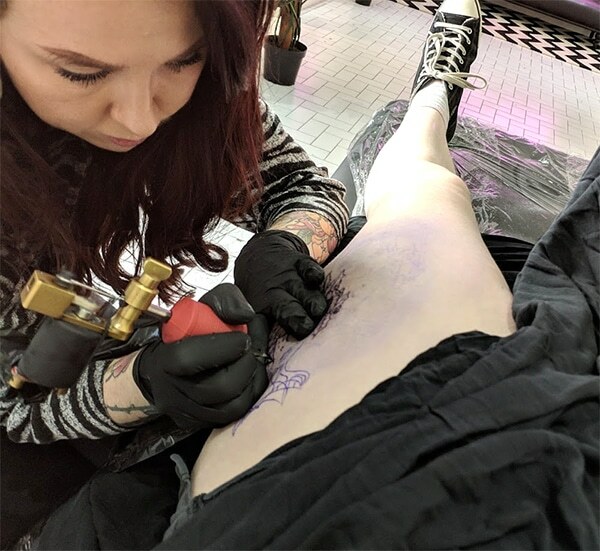 I don’t know if that’s because line work is different or because Gee is super gentle or because it was on my thigh! I think the tattoo took about an hour and a half in total but the time went so quickly and Gee was so easy to chat to! 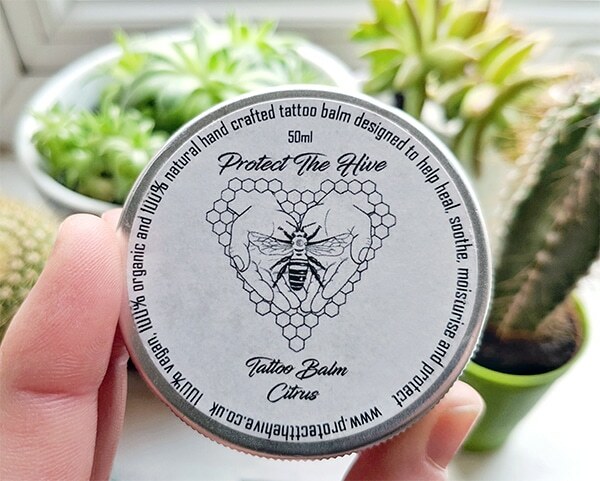 By the way, I use Protect The Hive balm for helping my tattoos heal quickly. I’ve used it on my last two and it’s amazing, plus it smells incredible and it’s vegan!! What more could you want? Your new tattoo is so beautiful! 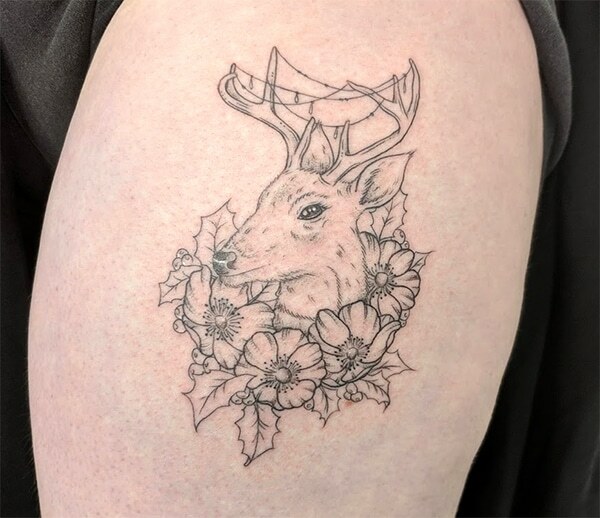 I love your deer tattoo! 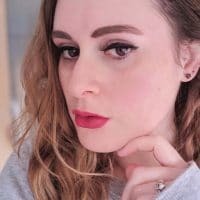 I too have this obsession with deers and stags, I have a metal stag head above my fireplace – it was my first item I bought for my house! 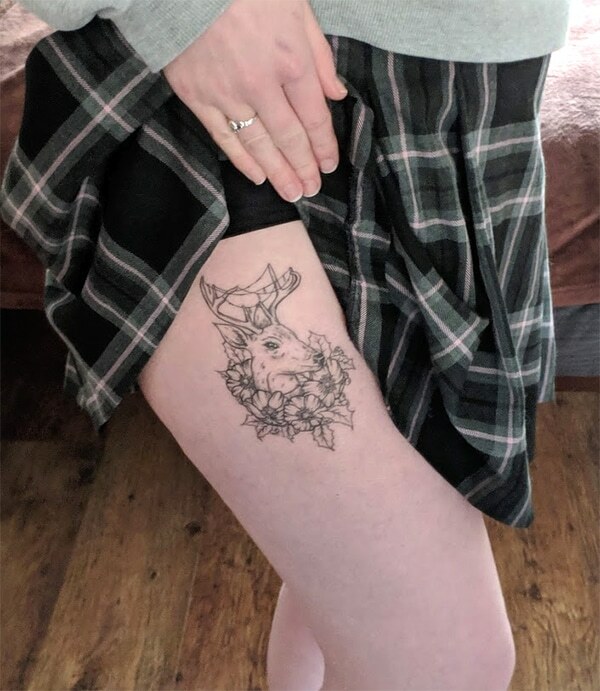 I love your tattoo posts! 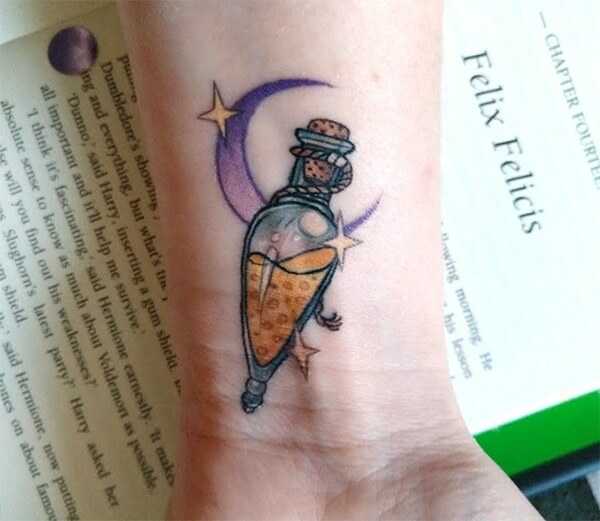 I remember the one about the Harry Potter potion and I just adored it. This is absolutely stunning, too! Also I properly cracked up at ‘side-thigh-deer’, and I think you’re absolutely right, the placement is beautiful. I’m so happy you got to get tattooed by Gee, it must have been soooo worth the wait and the end result is so so perfect. 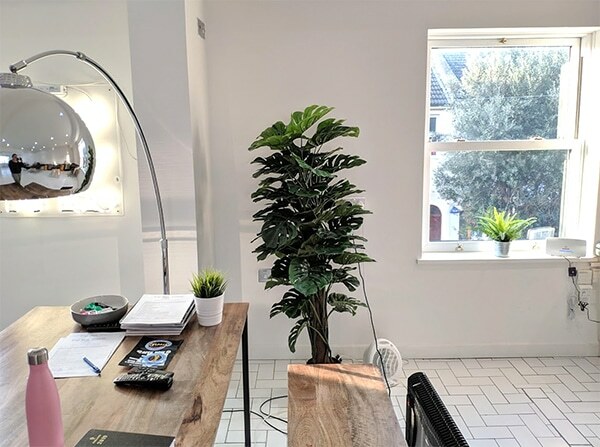 Also – HOW amazing is that studio! ?